In fact, this little fella is a descendant of the Temari Balls of the 7th century, which means hand ball. I actually thought he was a Basketball originally but on closer inspection changed my mind to a Volleyball. 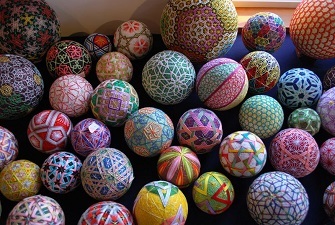 It wasn’t until I did a bit of research before this article was written that I came across the embroidered Temari Ball. I still like to think of him as a bouncing ball and that’s what makes him a unique character in the M.U.S.C.L.E. line. As my collection grows and I add more and more figures from the Japanese lines, it’s those figures that are a little unique and don’t have 100 different versions that I’m gaining a real appreciation of. He also has just enough size to not brand him with the four small M.U.S.C.L.E. and a nice low center of gravity that allows him to display well. However, I wish there was a Deka Kinkeshi made of this guy, just something about a 3-inch tall by 3-inch wide ball would have been cool in amongst the rest of the line. Some great figures were left out of that line and I’ll have to discuss that in an upcoming MMMM. So to finish off about The Mari, if you like him enough to go and chase the colored versions, there are only four plus a Flesh figure. Not a challenge at all and sometimes that makes me appreciate The Mari even more knowing I can build the collection rather cheaply and still enjoy the uniqueness of this guy. This entry was posted on Monday, January 30th, 2017 and is filed under UofM News. You can follow any responses to this entry through RSS 2.0. You can skip to the end and leave a response. Pinging is currently not allowed. I always thought this was a volleyball. My brain isn’t letting me believe anything else. Just read about Temari balls. They have quite an interesting Japanese history, and I never would have known about them without this article. The most interesting aspect, I think, is that it takes a lot of skill to make one. Fascinating.